Responders perform trauma training at a previous Rescue Task Force exercise. On Sunday, Oct. 14, from 1-4 p.m., emergency services personnel will be taking part in Rescue Task Force (RTF) training at the Ocean View Church of Christ. 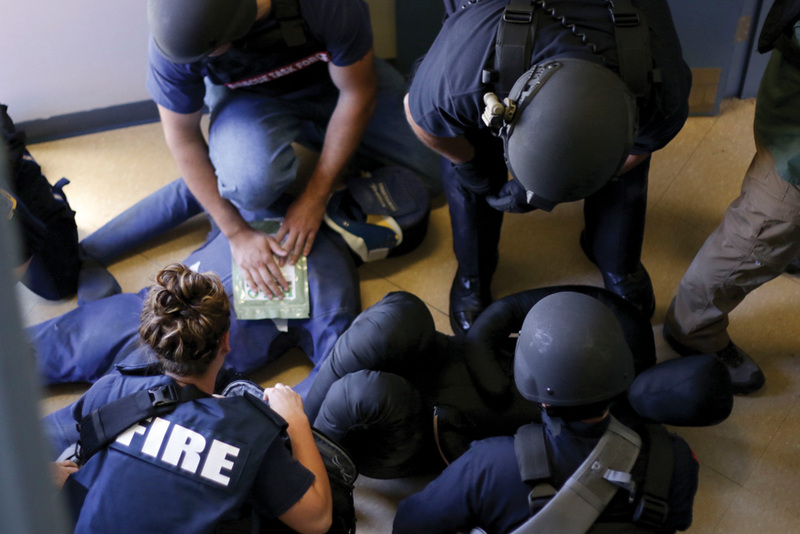 “It’s the type of training that is incorporated with active-shooter response for that type of event. 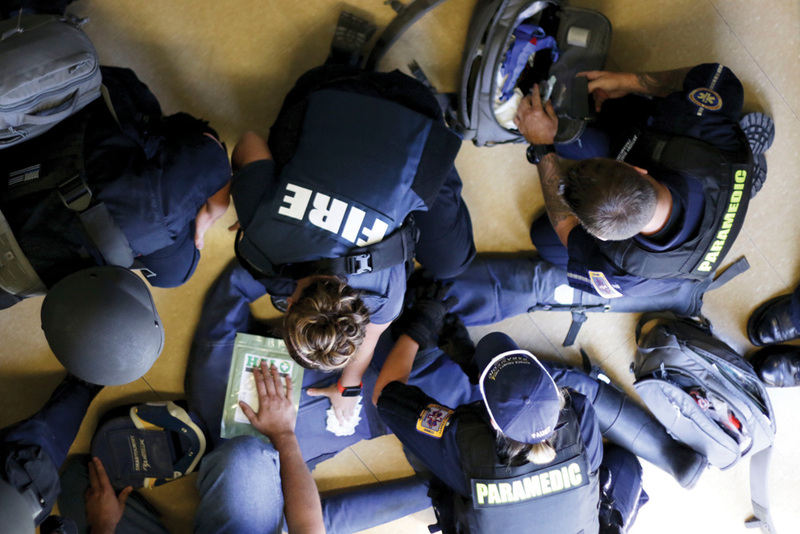 RTF is where teams of police, fire and EMS partner together and go into an active situation,” explained Ocean View Police Department Sgt. Rhys Bradshaw. Bradshaw said RTF training became the standard following the Columbine High School massacre in 1999. Bradshaw said the Ocean View police department has been doing RTF training for years — community members may recall seeing them train at Lord Baltimore Elementary School every summer. “It’s important to train, train, train for an event that you hope never happens,” he said. This weekend, the training has moved to a church down the street, but the scenario will be just as real. The scenario is being run by a private company that will be overseeing the training, in which those participating will be going into the situation without knowing what to expect. Along with Ocean View Police Department, Bethany Beach Police Department, Millville Volunteer Fire Company, Bethany Beach Fire Company, Sussex County Paramedics, DEMA, Ocean City, Md., agencies will also be participating in the exercise. Beebe Healthcare’s emergency room in Lewes will also be running some behind-the-scenes simulations in conjunction with the training. Bradshaw said response to the church will be based on how many officers are working that day and where they are in the county. While not all working officers will be physically responding, those who are participating in the event will respond in the time it would normally take those officers on the road. 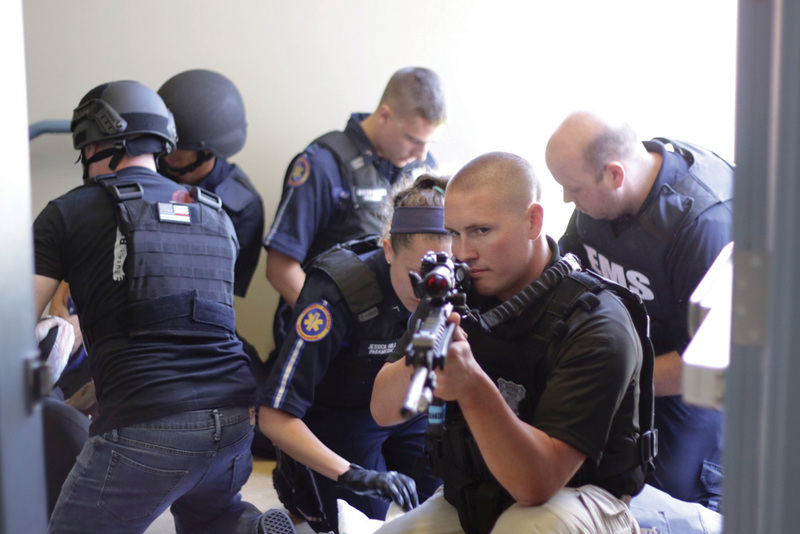 Training such as this is considered critical for police departments throughout the state, as Delaware State Police doesn’t have a fulltime SWAT team. Aside from larger exercises like the one scheduled for Sunday, Bradshaw said it is also vital for agencies to train throughout the year, to make sure they are prepared for the worst-case scenario. “There’s lots of stuff we can do. We work on tourniquet drills all the time, room-clearing, just anything like that. Some slow nights during the winter, we’ll call Millville, and if they’re not busy, we’ll practice movements through the hallways, patient evacs, carrying people… Little things like that we practice to stay fresh on everything. They’re skills that if you don’t use, you’ll lose it. Ocean View Church of Christ is located at 55 West Avenue in Ocean View. Law-enforcement said they don’t expect the exercise to impact traffic but are recommending that members of the public avoid that area between 1 and 4 p.m. on Sunday, Oct. 14.